I so sympathise with the impatience… I’m exactly like that as well. I’m waiting for different things (reviews at the moment, mainly), but yeah, every time you check and there’s nothing… Argh! Hey, romance is a serious business! 😉 And you may be in for a treat – I’ve literally just started posting up a romance as a serial. I hope you like, and please share the love if you do! I entered the FF contest too. I wrote mine months in advance to give myself time to let it “sit” before coming back to it. Unfortunately right around the deadline time I fell quite badly ill and while I submitted it, it was a rushed, unpleasant mess. I guess then, there wasn’t any reason to wait; I knew my submission wasn’t great. In truth, I was more gutted that I wasn’t able to do a better job and that I hadn’t signed up for the feedback. (Although the story was a mess, so I didn’t really feel any feedback would help). It was also a short story and for the life of me I cannot write shorts. Ironic really, because I’m not a waffling, exposition-dumping writer. My first draft its CRAWLING its way towards the 100k golden mark (although I have a lot that needs adding in a second draft). I’m getting off topic now, so I expect waiting is a pain. I haven’t exactly finished anything anywhere near ready for submission and probably won’t be ready until the end of this year/next year at the very least. So no news so far, about the pubbing of Radio Silence? Ugh, I wish we were at the point where we could actually submit Solus somewhere, but it just takes so much work! We’ve had the hell critted out of it, especially the beginning, and seems like there’s always something to fix. I know we gotta let it go at some point, but it must be as perfect as possible by the time we either self-pub or submit it to agents. Oh, I sympathize with you there. LoC is still far from the best it can be. Since I wrote Radio Silence only recently, the mistakes aren’t as plentiful as in LoC. But, my mom and sis still edited a whole lot of stuff in it. 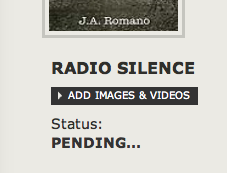 I’ve actually just re-submitted Radio Silence because they have a specific format.